So, where were we? Ah, yes! It honestly feels like the end of the road. Sixteen issues ago, Jeff Parker, Gabriel Hardman and Bettie Breitweiser came together and took the reins from Red Hulk creators Jeph Loeb and Ed McGuinness. However you looked at it, Loeb and McGuinness' successors had their work cut out for them. If you believed they were the team supreme and had made you enjoy the Hulk like none before, how could anyone measure up? 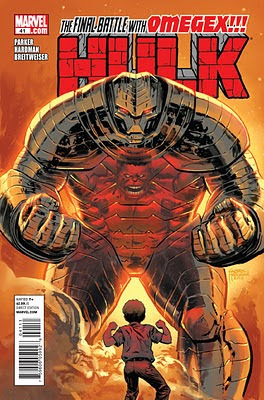 If you didn't like Red Hulk at all, how could anyone else take over and change your mind? It's truly a credit to this creative triad that they were able to take what the previous team did--love it or hate it--and build upon the legend, creating a more well-rounded Red Hulk with a multifaceted set of motivations and a varied league of villains. It's true that Loeb was only able to write the revealed Ross as Red Hulk for two whole issues (#23-24), so sure, take that into account. Even still, you can't discount the contributions made and the acknowledgments to previous continuity. In Gabriel Hardman's final issue, Jeff Parker is wisely able to wrap up the cosmic-league threat of Omegex while at the same time giving both Red Hulk and his antagonist Zero/One new beginnings (of sorts). And we've got General Fortean out there, plotting and scheming for another day. I've truly enjoyed the previous two segments of this storyline, and "Finality" here is no different. 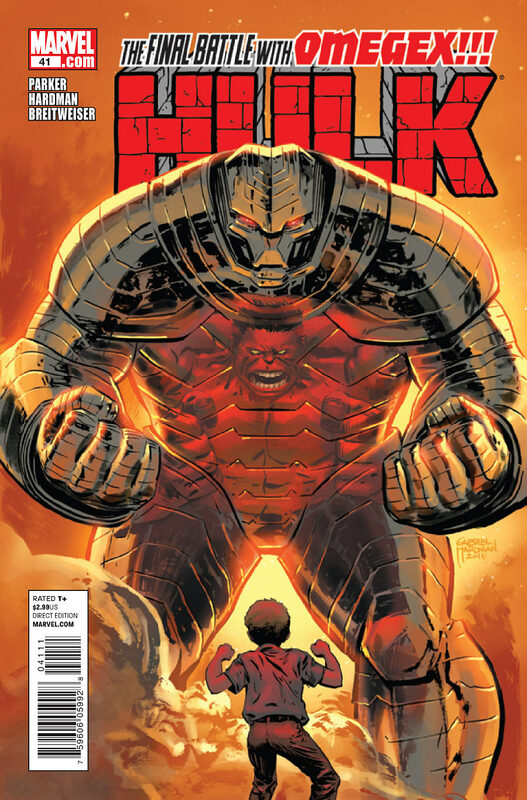 Although the physical battle here is between Red Hulk, who's been trapped in his super-powered form since his battle with Fortean in #31, and Omegex, who's been established as a threat since #28, it's the verbal chess match between Red Hulk and Zero/One that steals the show. The duo have had an unconventional team-up in the interests of defeating the world-ending threat, but it's always come back to the similarities and differences between the characters. Parker plays the characters off each other so well, and although I could tell how Zero/One would "help" Ross from early in this storyline, it was still a shock to see how much that assist had a bearing on the conclusion here. Kudos. As for Gabriel Hardman and Bettie Breitweiser, what can I say? These two artistic titans have taken Parker's scripts and amped up the emotional content several notches. The battle scenes are emotional, and the scenes that were meant to be touching to begin with ended up so much deeper. The looks into Red Hulk's past were especially sumptuous, and his own reactions to Zero/One's take on that past were priceless. It's hard saying goodbye to two terrific talents at once like this, but at the same time, I'm certain that new artist-in-residence Patch Zircher and colorist Rachelle Rosenberg will acquit themselves admirably in "Hulk of Arabia" and beyond. But hey! You'll have to read about them below. As for this issue, it could hardly be better. Echoes of the seventies Hulk under Len Wein! Modern sensibilities! Emotionally rich storytelling! Buy It! When last we left the Hulk, he was possessed by the hammer of the Worthy that made him Nul, Breaker of Worlds. After crash-landing in Transylvania, he found himself besieged by all kinds of monsters. Meanwhile, Dracula and his vampire legions ran around wondering just what they could do about this threat in their midst. At the conclusion of this issue, little has changed. Maybe. A little bit. Truthfully, not much. And that's the key complaint I have about this three-part miniseries. So far, it feels like a one-shot's worth of material needlessly spread across three issues for the sake of making nine dollars instead of three. (Or four, if a double-sized one-shot's your thing.) Ask yourself: where is the Hulk at the end of the first issue? The second? And what about Dracula and the majority of his ilk? Not only are they in virtually the same places, physically, they're in the same place in terms of characterization, too. 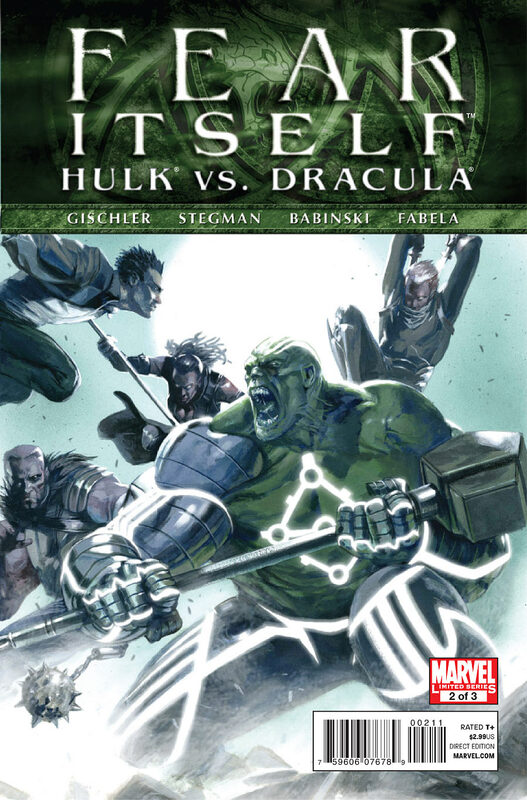 Hulk is still smashing monsters and Dracula is still plotting to stop him. Oh, Dracula sent a few of his vampire soldiers against the Hulk and he beat them? He did that last month, too. 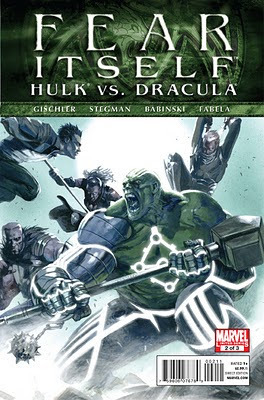 Ryan Stegman and Mike Babinski step out of the comfort zone they found in such emotionally and comedically rich stories as the recent She-Hulks and Amazing Spider-Man work they did, and their work also falls far short of the mark. After a promising start, the art just doesn't hold together, which seems almost as much of a critique on their strengths as it does an indictment of the story being told. Horror just doesn't suit this team. Again, the key fault lies in the two sides here. You've got a brainwashed Hulk blindly smashing things without any emotional underpinning. Add to that a vampire nation of characters who just aren't very interesting, nor do they possess enough honorable attributes so one might root for them against the Hulk. Guys, with one issue left, I'm trying, I really am. But with this issue virtually a regurgitation of the first, you should really Burn It. Thanks to James Sime of that great bastion of San Francisco comics goodness, The Isotope, I got a B&W preview of this book this week. (If anyone went to San Diego Comic Con this year, you know the preview of which I speak!) As mentioned above, it's the first regular issue for new artist Patch Zircher, an artist I've long admired since the days of Evan Skolnick's New Warriors in the mid-nineties. He illustrated a recent issue (#36), and I've hoped he'd return. Here he is! Loosed from the threats of Zero/One, Black Fog and Omegex, Thad Ross finds himself once more at odds with General Fortean. While that's nothing new, the situation he finds himself in as result is. When he discovers an old friend has died at the hands of a terrorist in the Middle Eastern nation of Qatar, he decides to exact righteous red vengeance. Of course, that'll end up going so well, right? After the tension of the previous storylines including "Omegex," the beginning of "Hulk of Arabia" feels tame by comparison. Don't get me wrong--it's still a solid story by Jeff Parker that plays to Ross' military strengths--but anything after those emotional heights is naturally going to feel lacking. The story comes alive with artwork by the aforementioned Patch Zircher. After getting his feet wet in issue #36, he really comes to play this issue. 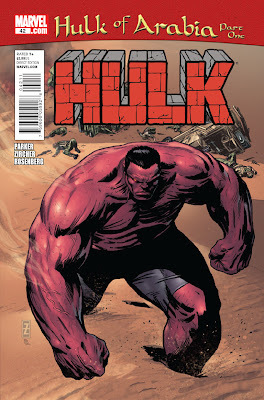 His Red Hulk is appropriately big and mean, Thad Ross is determined, and every sequence is convincingly rendered. Keep in mind, this is in black-and-white; I haven't even glimpsed Rachelle Rosenberg's colors yet, and won't see them until next Wednesday. Still, as powerful as the linework is, the look can only improve with the addition of a quality color artist. If you've been longing to see Thad Ross use more of his military history as the Red Hulk, then look no further. "Hulk of Arabia" looks to be another winner from Jeff Parker. It starts off on the ground floor and just keeps rolling. For now, Read It, but if it's anything like previous epics from Parker, I'll be upgrading that rating on successive issues!